Bluecol is the original Nº1 Premium Anti-Freeze brand and has cared for and protected engine cooling systems since 1937. Bluecol was originally developed and manufactured by Smiths Industries, the aviation specialists, the name Bluecol was registered in 1934. Continuing Bluecol’s leading brand format, Tetrosyl has developed a patented formula. Bluecol ‘U’ is the first clear antifreeze that can mix with any colour or type. The Bluecol range has a wide variety of both cleaning and maintenance products to meet the needs of all seasons. Today there is a Bluecol range to suit commercial and domestic users, including a full range of premium products including wiper blades. Bluecol OE40 is a coolant which provides the advantages of both silicate and silicate-free coolants. This hybrid organic acid technology allows for excellent protection from corrosion as well as a longer working life. 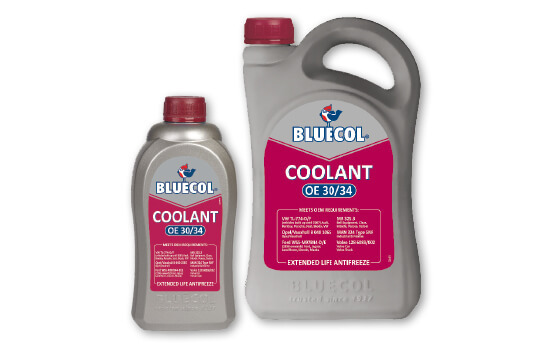 Bluecol OE40 Coolant is a high performance ethylene glycol based coolants which provide the optimum level of engine cooling as well as protection against freezing down to temperatures as low as -36°C when diluted 50:50. To prevent ingestion this product contains a bittering agent. Bluecol OE48 is a coolant which contains a mixture of organic and inorganic corrosion inhibitors. The utilisation of this hybrid technology allows the engine to stay protected in both hot and cold environments. 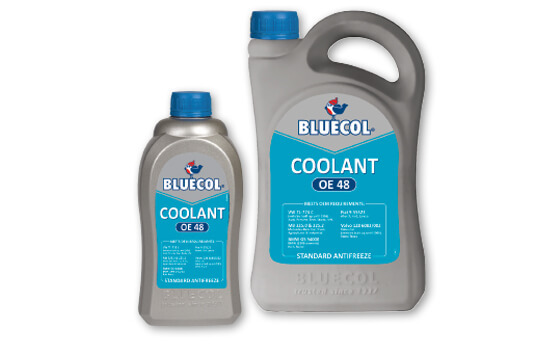 Bluecol OE48 Coolant is a high performance ethylene glycol based coolants which provide the optimum level of engine cooling as well as protection against freezing down to temperatures as low as -36°C when diluted 50:50. To prevent ingestion this product contains a bittering agent. Bluecol OE05 is a coolant mostly used in Commercial Vehicle and Industrial applications. As a hybrid coolant it utilises a mixture of organic and inorganic corrosion inhibitors to give optimum protection of the cooling system. 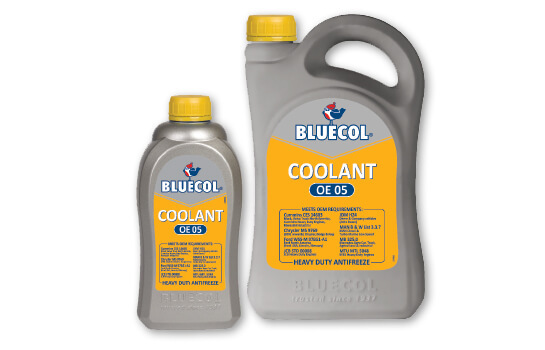 Bluecol OE05 Coolant is a high performance ethylene glycol based coolants which provide the optimum level of engine cooling as well as protection against freezing down to temperatures as low as -36°C when diluted 50:50. To prevent ingestion this product contains a bittering agent. Bluecol OE30/34 covers the most key manufacturing specs out of our OE range. The organic acid technology and absence of silicates means that this product is suitable for modern Ford and GM engines. 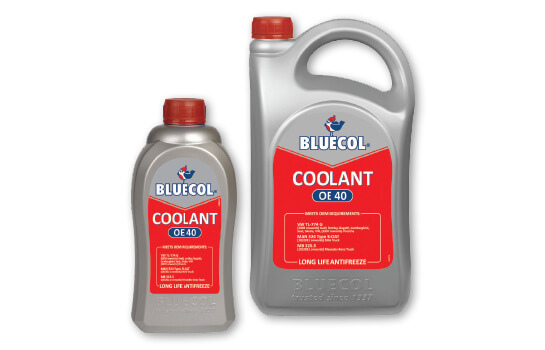 Bluecol OE30/34 Coolant is a high performance ethylene glycol based coolants which provide the optimum level of engine cooling as well as protection against freezing down to temperatures as low as -36°C when diluted 50:50. To prevent ingestion this product contains a bittering agent. 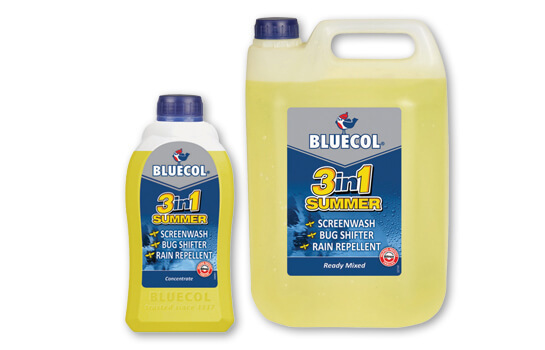 Bluecol 3 in 1 Summer Screenwash is a quality screenwash designed to clean vehicle windscreens in the summer months. The specially balanced 3 in 1 formula has been scientifically formulated to actively repel bugs from sticking to the windscreen, as well as allowing the windscreen to be easily cleared of tree sap and road grime. With every use a rain repelling coating is applied to the windscreen, this will improve water beading meaning clearer vision and improved driving safety during summer showers. Contains Bitrex to help prevent accidental swallowing and consequential harmful effects to humans and animals. 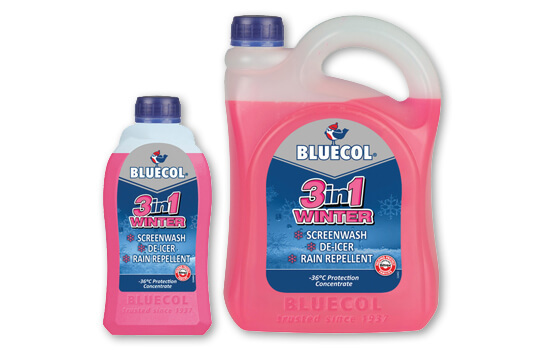 Bluecol 3 in 1 Winter Screenwash is a quality screenwash designed to clean vehicle windscreens in the winter months. The specially balanced 3 in 1 formula contains ingredients that help to prevent freezing in temperatures down to -36°C. Bluecol 3 in 1 Winter Screenwash also contains a de-icer to help clear your windscreen in times of frost/snow. With every use a rain repelling coating is applied to the windscreen, this will improve water beading meaning clearer vision and improved driving safety during winter downpours. Contains Bitrex to help prevent accidental swallowing and consequential harmful effects to humans and animals. Does not contain salt or harsh detergents. Bluecol Sub Zero Screenwash is the stuff you need when it’s really cold. Unless lesser products this will protect down to -18C even when dilluted. Highly recommended. Have tried once (Bluecol Rain Repellent) and am really impressed. The rain just seems to ‘ping’ off the screen – weird! Usually putting my back wiper on several times but it was pouring the other day and hardly needed to us it at all – the rain was just running off. Don’t quite know how it works but it does! I bought bluecol for my classic car because you cannot just put any old antifreeze in it. The 2 year Bluecol meets the specification. 1 happy customer!